Bob Graham was a Keswick guest house owner and keen fell runner who set out in 1932 to make a continuous round of 42 peaks (one for every year of his age) in his beloved Lake District during a single 24 hour period. His incredible feat set a record that remained unbeaten for 28 years despite many attempts. Today many people have completed the 24 hour round but it still remains one of the most demanding challenges available to athletes or mountaineers. At Wandering Aengus Treks we have taken this gold standard event and turned it into a remarkable mountain walking holiday. By devoting a whole day to each of the five legs of the 24-hour Bob Graham Round, we have brought this amazing route into the realm of possibility for the mere mortals among us. However, even over five days it remains a significant challenge with an average of 15 miles and up to 6,000 feet of ascent on each day. Leg 1 of the Bob Graham Round begins at the Moot Hall in Keswick and ends in Threlkeld. This leg includes the Northern Fells of Skiddaw, Great Calva and Blencathra. Total 12.5 miles - 2570 feet of ascent. A long day of ridge walking. Starting at Threlkeld this leg takes in the superb ridges of the Dodds and Helvellyn range finishing at Dunmail Raise. The fells covered in this leg are Clough Head, Great Dodd, Watson Dodd, Stybarrow Dodd, raise, Whiteside, Lowman, Helvellyn, Nethermost Pike, Dollywagon Pike, Fairfield and Seat Sandal. Overnight in Grasmere. Total 15 miles and 6154 feet of ascent. A very big day over the summits of Steel Fell, Calf Crag, High Raise, Sergeant Man, Thunacar Knott, Harrison Stickle, Pike O' Stickle, Rossett Crag, Bowfell, Esk Pike, Great End, Ill Crag, Broad Crag, Scafell Pike and Scafell. There is absolutely no doubt you will sleep tonight. The day ends in Wasdale where a comfortable bed awaits. Total 17 miles - 6830 feet of ascent. Only a little easier and another magnificent day from Wasdale on Leg 4. Today's famous names are Yewbarrow, Red Pike, Steeple, Pillar, Kirk Fell, Great Gable, Green Gable, Brandreth, and Grey Knotts giving some of the finest mountain walking in the district. This leg of the Bob Graham ends at Honister Pass for a night in one of the YHA's more remote hostels close to the summit of the pass. Total distance 12 miles - 6,500 feet of ascent. The final leg of the Bob Graham. Starting at Honister the traverse of the final three peaks of Dale Head, Hindscarth and Robinson, leads to the downhill (well mostly) leg all the way back to the Moot Hall in Keswick. Extra nights can be arranged for those who need to stay tonight in Keswick. Total 10.5 miles - 2425 feet of ascent. This itinerary completes the Bob Graham over a slightly more 'restful' 6 days, splitting the toughest third leg of the 'Bob' into two. This does mean extra miles and extra ascent as it is necessary to descend into Langdale and then re-ascend the following morning, but overall this makes for an easier round. We split the toughest leg of the Bob Graham over two days. Today we tackle the summits of Steel Fell, Calf Crag, High Raise, Sergeant Man, Thunacar Knott, and the Langdale Pikes of Harrison Stickle and Pike O' Stickle, before making our descent to the pretty Langdale Valley. Total 11 miles and 3235 feet of ascent. Part 2 of Leg 3. We start with an easy stroll along Mickleden before climbing first to Rossett Crag, then its Bowfell, Esk Pike, Great End, Ill Crag, Broad Crag, Scafell Pike and Scafell. Finally we descend to Wasdale where a comfortable bed awaits. Total 11 miles - 5060 feet of ascent. Another magnificent day from Wasdale on Leg 4. Today's famous names are Yewbarrow, Red Pike, Steeple, Pillar, Kirk Fell, Great Gable, Green Gable, Brandreth, and Grey Knotts giving some of the finest mountain walking in the district. This leg of the Bob Graham ends at Honister Pass for a night in one of the YHA's more remote hostels close to the summit of the pass. Total distance 12 miles - 6,500 feet of ascent. As keen walkers ourselves we appreciate the importance of the place you put your feet up and rest your head in at the end of each day. We very carefully select our accommodations whether they be a cosy pub, family run guest house, or established town centre hotel. We choose places directly on the route or within easy walking distance of it and if we ever have to transfer you because of limited availability, we will always contact you to discuss this and never just leave you to find out later. We provide comfortable, clean and warm twin or double rooms, with private bathroom wherever available. Single occupancy of rooms is also available for a supplementary cost. Please note that on the route of the Bob Graham there are two overnight stops where accommodation is very limited. We cannot guarantee private bathrooms or single occupancy of rooms at these two overnight stops. If required, we can provide transfers to alternative accommodation offering private bathrooms/single occupancy at an extra charge of £50 per transfer (price is for one or two persons and includes two journeys per transfer - i.e. out and back). 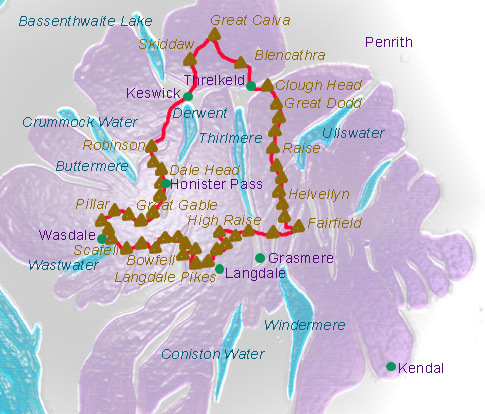 The Bob Graham is a strenuous round of 42 fells in the Lake District. The daily distances range between 12 and 17 miles (12 and 15 miles for the 6 day round), with up to or over 6,000 feet of ascent on each day. The total distance covered is around 66 miles and the total ascent is over 26,000 feet - not far off the height of Mount Everest! Your main baggage is transported between overnight stops so you need only carry the things you need for a day out on the fells.